The 4WFBS120 is a 4-wire, full-bridge module that provides completion resistors for a strain gage or other sensor that acts as a single variable resistor. 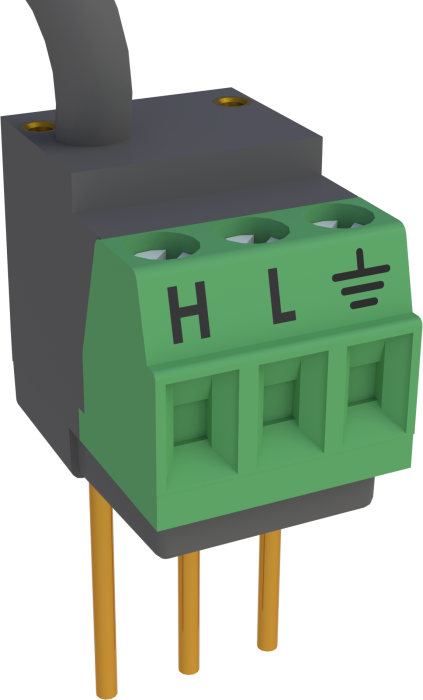 This module should be used to measure sensors that have a 120 ohm nominal resistance. The 4WFBS120 completes a full Wheatstone bridge. It can also be used to complete the back half of a Wheatstone bridge for use in a ¼ bridge strain circuit (one active element) using a dummy gage, or in a ½ bridge strain circuit (two active elements). 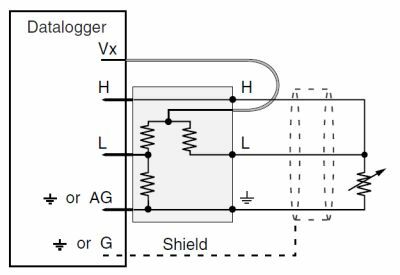 The Wheatstone bridge circuit converts small changes in resistance to an output voltage that our dataloggers can measure. The 4WFBS120 includes two external pins that allow customers to perform shunt calibrations, which are used to correct for sensitivity errors. The 4WFBS120 is compatible with our multiplexers. The 4WFBS120 uses one differential analog input; an adjacent analog ground channel accepts the "ground prong" of the 4WFBS120. Not all datalogger terminal strips have this sequence on all channels, so please check your datalogger's wiring panel to confirm channel assignments, especially if you plan to use multiple Terminal Input Modules. The lead wire that emanates from the head of the 4WFBS120 connects to a datalogger excitation channel. Please note that if a CR10X will be used to measure thermocouples in the same application, newer CR10X Wiring Panels and the CR10XTCR Reference Thermistor (with its accompanying Thermocouple Cover) are deep enough to cover the datalogger input channels with a Terminal Input Module attached; older CR10TCRs are not deep enough. The 4WFBS120 is measured with the BrFull Instruction in CRBasic, and with Instruction 6 (Full Bridge) in Edlog. How many strain gages can be hooked up per excitation channel using a CR1000 and multiple 4WFBS120 modules? The CR1000 excitation channel current limit is 25 mA at 2500 mV. Using 120 ohm gages with multiple 4WFBS120 modules, only two gages can be hooked up for each excitation channel with 2500 mV excitation. If three gages per excitation channel are used, the excitation needs to be reduced to approximately 1750 mV.